CarpetPriceGuides.com is a consumer price guide specifically designed to help homeowners research and budget carpet prices for their home. The information we’ve gathered to determine the cost of carpet and installation is continually updated week by week and month by month from our own experience in the industry, leading online resources, flooring industry data and directly submitted prices from our customers. The result is current and accurate 2016 carpet pricing data. The listed costs are meant as a guide, for more accurate quotes for your carpet project go ahead and request free estimates from qualified local contractors in your area. Below you will see quick links to carpet prices per square foot for best brands, retailers and construction quality. We also guide you through padding prices and carpet installation costs, plus the total cost you can expect to pay for buying and installing carpet. Finally we have homeowner submitted quotes to give you a clear idea of prices in your area. Whether you decide to buy from one of the big box stores, from your local carpet store, or shop online for discount carpet deals and prices, you will come across the same big brands time after time. The price list below looks at the prices from the top carpet brands across the range of their products. You will see average recommended retail prices as well as wholesale prices that you can find online. Note: wholesale carpet prices are very attractive, but often only available online, requiring the customer to buy more or less sight unseen (apart from swatches or samples). The customer will also be responsible for sourcing and paying for local qualified carpet installers (see below). Many consumers start their search for a new carpet at one of the recognized big home improvement or flooring stores. Companies like Empire, Costco and Luna don’t advertise their carpet pricing, requiring customers to receive a free in home inspection and estimate. Lowes and Home Depot, however, do provide carpeting prices and in the table below we look at their average prices across a range of carpets. Please note: All the big name stores offer carpet installation on their products and many of the offers look mouth-watering at first glance. Please be aware that the apparent low cost of “basic installation” won’t cover a large range of factors. Removal and disposal of old flooring, sub-floor preparation, new tack stripes, stairs and complicated floor plans can all add to your final installation bill. Q: What does cut pile carpet mean? A: Cut pile carpet is carpeting made by looping yarn through a backing and then cutting the outer edge of the loops to a uniform height. 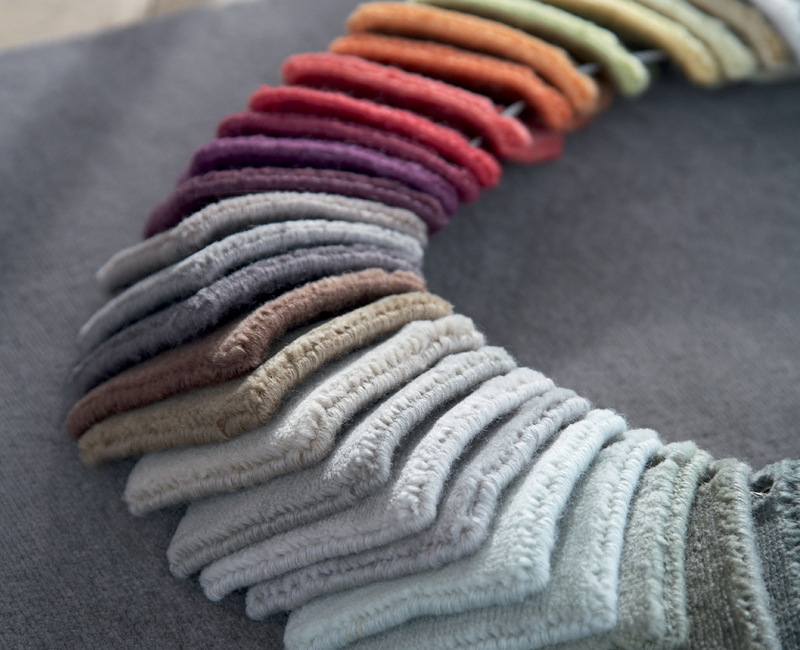 Plush is another name for cut-pile carpet. Q: What is frieze carpeting? A: A frieze carpet, also called shag carpet, is one made by adhering twisted carpet loops to a backing in loose manner, so that the fibers flop over, giving the flooring the advantage of not showing footprints or vacuum marks. The prices below look at average carpet price per square foot across all ranges of styles taking into account the quality of construction, durability and materials used. 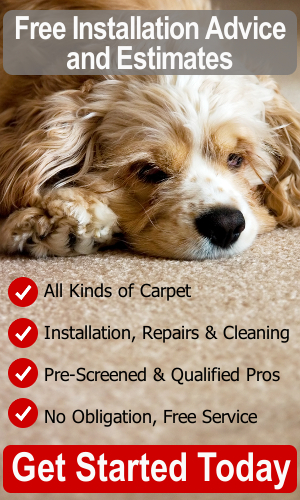 There’s no doubt you get what you pay for when it comes to carpet quality. What your carpet is made from will go a long way to predicting how long it will last and how luxurious the feel. That said it can make sense to buy cheap carpet for low traffic areas like a home office, where an olefin based carpet could be ideal, and splash out on an expensive wool carpet for your master bedroom. Homeowners must factor in the cost of carpet padding (or cushion) when installing new carpet. The right grade of carpet padding is essential if you want to get the most out of your carpet in terms of comfort and durability. And it’s not just a case of choosing between a cheap carpet pad and a more expensive one. Different pads will be specifically designed and better suited to a certain type of carpet. Most padding is made of foam or rubber but within those categories are many sub-categories including high-density foam, urethane foam, memory foam, slab rubber, waffle rubber and more! You should check the carpet manufactures recommendations to determine the right pad to use. Average carpet padding costs range between $0.25 and $1.10. Factors that can affect carpet padding prices include thickness and density of your pad, anti-bacterial protection and moisture barriers. Popular brands that you can expect to see down at your local DIY warehouse include ScotchGard, Future Foam and TrafficMaster and the big carpet manufactures like Mohawk and Shaw also sell their own brand of carpet pad. When it comes to calculating the cost of installing carpet your location becomes the crucial factor. Prices are set by local private contractors based on supply and demand. The lower the demand the likelier you will be able to find cheaper carpet installation. The cost to install carpet will also vary depending on the complexity of the job. The price table below shows low to high prices across a range of cities and states, for definitive carpet prices installed in your area you should look to get written estimates from up to three qualified local carpet contractors. Learn More about Installation Costs. Please note that the cost to install carpet on stairs is usually priced separately and by the step. A standard staircase of 16 steps would cost anywhere between $64 and $220 depending on the type and complexity of the stair installation. Working from the data above and our experience in the industry we can extrapolate approximate costs for a complete carpet project from start to finish. The following table takes a 1000 sq/ft project as a baseline and does not include extras that might factor into the final cost, like the disposal of old carpet, carpet stair installation or unforeseen extra preparation of the sub floor. It does include delivery costs, padding, surplus carpet to cover waste and future repairs, work equipment and supplies. Good, Better, Best refers to quality of carpet from a non-discounted retailer. The carpet prices above reflect an accurate analysis of average carpet cost across the US, but it is just that…a guide. We love to hear specific quotes and final prices from our visitors because they are the best source of exact pricing in your local area. When you provide information on your project costs we delete any and all personally identifying details to assure complete anonymity. We sure would love to hear from you with your experience of buying and installing new carpet. Please click here to complete the short pricing detail questionnaire. We never share any personal information and will add your carpet price estimate to the ones below. Thank you in advance. Carpet cost $2300 and installation cost $1550. Carpet $2.55 sq.ft. and $1.33 sq.ft for removal/disposal, mid grade padding for radiant floor heat, & install. Locally owned carpet dealer. Beautiful carpet (not cheap) put down in two bedrooms (with closets) and hallway. Not a complicated job and I think the installation price was a bit high at $2 per square foot. Low cost carpet installation in every room of the house (except bathroom and kitchen). Smartstrand Triexta carpet which looks great. New carpet installed by local contractor throughout 1st and 2nd floor of new build; all bedrooms, hallways and stairs. Stairs were priced separately. Got a great deal on the carpet around $3 per sq/ft, 50% discount. Installed in home office, study and living room. New carpet installed in bedrooms, hallways, living room and study. Straight forward install, no surprises, happy with Home Depot installers. Carpet tile at just under $3 per sq/ft. DIY installation with the help of a handyman friend. Great job, all done in a couple of days. Good quality nylon carpet at just under $4 per square foot. Installers were professional, quick and …cheap! Installation was for upstairs bedrooms and hallway. Decent quality Berber ($2.50 sq/ft), installation a round $1.50 per sq/ft and an extra $500 for disposal of old floor and stairs. This polyester and stain resistant carpet was good value at around $1.50. Pretty happy with installation, took a bit longer than anticipated. We’ve been receiving some questions from our readers and have decided to share them (and our answers) here on the site. So please, if you have a question you’d like answered please drop us a line and we’ll answer it here or in the relevant section of our site.